Whipped cream is a sweet treat that we’ve been creating for centuries. As air is beaten into milk with a high enough fat content, the fats trap the air in tiny bubbles. With enough bubbles, the cream loses its liquid qualities and starts to hold its shape. The earliest recipes for whipped cream date back to Italy in the mid 1500’s. 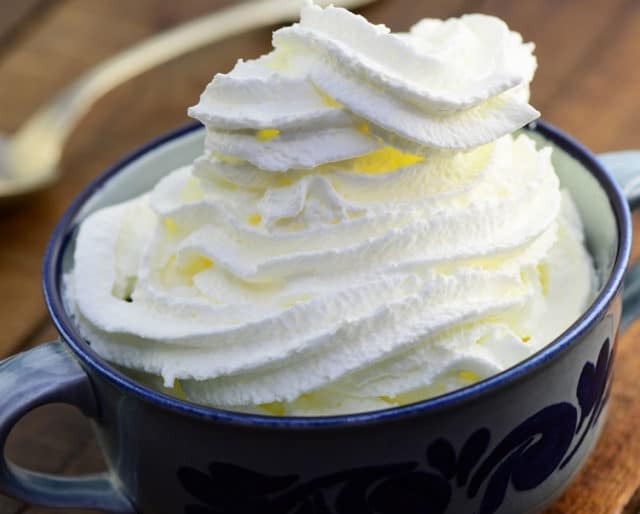 Not actually called “whipped cream” until the late 1600’s in England, early recipes dubbed the confection “snow milk” and recommended beating heavy cream with a willow branch until foamy. Now that we have sanitized whisks and modern food processing machinery, whipped cream is widely available in a range of flavors and textures. You can find chocolate whipped cream, mint whipped cream, and tubs of whipped-cream substitute that never goes flat. Then there’s heavy whipped cream, which has a higher fat content for a richer taste and sturdier peaks. Whether you like the convenience of whipped topping from a can or the sweet satisfaction of whisking up a homemade batch, be sure to celebrate the joys that whipped cream has brought you personally —and to all of us around the world —on National Whipped Cream Day this January 5. If you don't usually eat dessert, make an exception on January 5 and treat yourself to a light and airy treat like strawberries and whipped cream. Tired of the same old whipped cream? Try something different, like minty whipped cream on yellow cake or chocolate whipped cream on your sundae. If you're sick of the standard whipped cream desserts, try using whipped cream instead of ice cream on a dessert like cobbler, bread pudding, or pie. You could even combine whipped cream with other flavors like salty french fries or spicy corn chips. Canned whipped cream is definitely convenient, but it's easy to make your own whipped cream at home. For standard whipped cream, combine whipping cream (or heavy whipping cream), sugar (or powdered sugar), and vanilla extract in a mixing bowl. Beat with an electric mixer until peaks form. Small peaks indicate less air bubbles, yielding a softer whipped cream that will slowly flow and puddle. Whip longer for larger peaks, which mean the whipped cream will hold its shape for more time. Whipped cream isn't just for dessert, and National Whipped Cream Day is the perfect opportunity to branch out and try something you haven't tried before. If any of your local restaurants serve a dish with savory whipped cream, take a friend out to give it a try! Or invite a friend to your place for dinner and whip up an un-sweet version of the topping yourself. A dollop of salted whipped cream pairs well with many soups, or you could infuse your whipped cream with herbs for a refreshing addition to your favorite pasta dish. With its simple recipe and our kitchen technology, we've been happily topping our foods with whipped cream for generations. Though we often think of whipped cream as the sweet white stuff dispensed from a can, the term "whipped cream" applies to anything made by introducing air bubbles into milk fats. Some whipped cream contains no sugar at all, relying on the natural sweetness of the cream to be enough. Other whipped creams are savory, blended with herbs or essential oils to create interesting fusions like lavender whipped cream atop flaky pastry or even basil whipped cream on lasagna! It doesn't get easier than whipped cream from a can — just pop the cap, aim, and spray. Whether you want a dollop in your coffee or a mountain on your sundae, whipped cream has never been more available for your instant gratification. Ever since the aerosol can was first invented in the mid 1900's, we've been enjoying whipped cream with more convenience than ever before. On National Whipped Cream Day, even the busiest of us can find time for a little dessert satisfaction. It's pretty well-known that too many sweets leads to health problems, and many of us have started avoiding desserts overall. But the occasional treat poses no threat to your health, and National Whipped Cream Day is a great excuse to break the rules and let yourself off the hook for a change. Plus, a recent food study found that people who felt guilty while eating dessert had reduced immune functions during the experience, whereas people who enjoyed their dessert had boosted immune responses instead.